... I become an husband! With just a few hours to go, I'm in a state of resigned, disembodied, disbelieving calm, hoping that everything works out OK. Some of you will be there, and I wish I could invite all my readers along - in addition to the fine Indian food coming our way, there'll be champers, wine, and Hobson's Twisted Spire on gravity, and of course Wedding Cake made by my very own Grandma! But, more important than any food or drink is the fact that I'm getting married to the girl I love. The girl I cuddle up with at night. The girl for whom I cook pancetta risotto and full English breakfasts. The girl who keeps me company while I'm quaffing myself into a frenzy at a beer festival. No doubt, I'll be back when we return from our honeymoon Romania and Hungary with tales of Ice hotels, Paprika cultivation, and the culinary delights of Transylvania. Until then, I hope your days are as exciting and full of love as mine will be! I guess Sod’s Law dictates that a particularly busy time at work should coincide with the last few weeks of planning for my wedding (which we are largely organising ourselves) and the cumulative effect is to increase my stress levels while decreasing my free time. Consequently, I’m feeling pressure from within to give up blogging, sleeping, cooking or possibly all three! But that’s just not how I roll, nor will I countenance any notion of buying instant ready meals rather than cooking proper dinners from scratch. Pah! The thing is, I don’t find the purported convenience thereof even remotely tempting. Microwave meals have never done it for me. Nor indeed anything that needs to be 'boiled in the bag', kept frozen until it's time to heat it up, or, worst of all, which can be stored indefinitely at room temperature in a tin can. 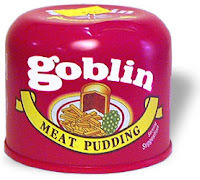 I was standing in a very long queue for the checkout at Tesco the other day – so long that it extended two third of the way down the tinned food aisle – and what I saw there reminded me of products I’d eaten as a tiny child, but assumed had long since disappeared from the nation’s shelves. Baked beans with mini pork sausages. Tinned ravioli and spaghetti bolognaise (both of which, I recall came in the same sauce as baked beans). Fray Bentos tinned pies. 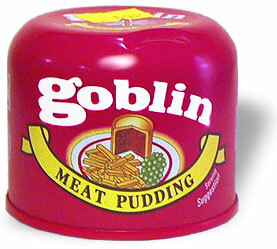 Goblin meat puddings. Ugh. I like sausages. I like ravioli and spaghetti bolognaise and pies and tomato-based sauces. But my understanding of all what these things should look and feel and taste and smell like is a world apart from the tinned versions. Well, Happy New Year, folks. The tenacious longevity of my coldy-fluey-swiney ailment has meant that I've been functioning well below 100% through the festive season and into 2011, but I think I've hit upon a tasty cure which I'll share with you today. During the Winter months I enjoy mulling wine, as, I'm sure, do many of you. It's a simple way to rustle up some festive cheer - a rough red, heated up with some apples and oranges, and the classic seasonal spice combo of cinnamon, ginger, nutmeg and cloves. Mmmmm. Warms the heart, so it does. I've also mulled ale and cider a few times over the years. Give me a naked flame, a handful of cloves and a cinnamon stick and I'll mull anything, me. But the other day I began - ahem - mulling over a little vinous thought that just wouldn't go away. What about mulled white wine?